An evening's training normally begins with some form of callisthenics to loosen up and what we term Suburi or practice swings of the Shinai. These preliminary exercises are sometimes performed individually by students and also in group form. Suburi is the most important exercise in Kendo since it develops the stroke and can also be employed to build up stamina and strength, which is naturally important for drawn-out matches or practice sessions. San-kyodo-no-suburi (cutting in three stages) is the basic form. 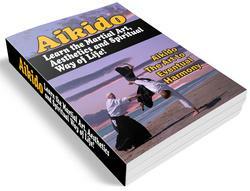 The first action is to raise the blade, thrusting forward and upwards as in diagram 11. After the highest point, 11e, the arms are folded back as in plate 106 and the body is stretched upwards so that the fullest possible circle is made and the joints well stretched. To do this the right arm must relax its grip and revolve about the hilt as it is turned by the left hand; this is shown in plate 107 and it will be noted that the left hand has retained its grip so that the cutting edge of the Shinai faces to the direct right. The Shinai touches the base of the spine and the hands have turned inwards. 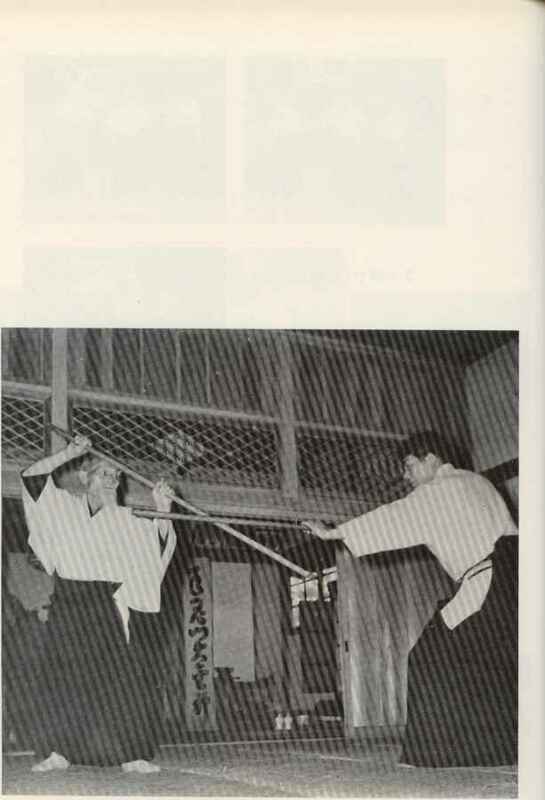 The cut is performed by simultaneously stepping forward with Tsugu Ashi (following feet) and cutting by throwing the Shinai upwards and outwards with the left hand. The right hand gradually revolves as the left hand turns the Shinai to its original position, but in this case the action is delayed so that the correct hand position is re-assumed at the exact finish of the cut. Plate 108 shows almost the final instant. The left leg is just drawing up to position and the hands are just about to squeeze as the wrists snap inwards. The cut is halted at head or eye level. Suburi are always made in this very wide and exaggerated action to give maximum exercise and often the novice cuts only in this way throughout his initial training. The cutting at head level may be varied by diagonals but it is not necessary to exercise cuts against other targets in this way since only a matter of height is involved. This is automatically adjusted just as we adjust to varying heights of opponent without effort. Mae-ato-suburi are the normal form in which cuts are made forwards and backwards in a rhythmic fashion, with the cutting action coordinated with the footwork. A more exhausting form of Suburi for stamina training, are Tonde (with a leap) Suburi in which a jumping or skipping action is made rather than a simple sliding step. Sonkyo (crouching) Suburi strengthens the legs and may take the form of cutting whilst sinking and rising from this position or may consist in bouncing up and down whilst cutting from this position, or even cutting and walking. The most exhausting of all are Tobigaki (jumping) Suburi in which the student leaps as high as he can and attempts to touch his buttocks with his heels as he raises the Shinai and cut as he lands again. It is really true that no progress is possible without Suburi training and the keen student should set himself a target of 500 or 1.000 cuts per days if conditions allow. It will be noted that in the final action the right shoulder swings a little forward since the right hand is advanced on the hilt, but the hips remain square. This swinging forward should not be exaggerated and the student will find it occurs naturally if he concentrates rather on keeping the shoulders square but letting the shoulder come forward a little if this feels awkward. The student will almost certainly find his hands blister until a tough hardened palm develops. Callouses along the forefinger show that the technique is incorrect, the areas of callous as shown in diagram 12 give a good guide to correctness of technique. The right hand is hardly affected. Correct footwork will also cause blistered feet until the soles harden, after which very little trouble is experienced. The only injuries normally resulting in Kendo are a few bumps and bruises from blows and sprains or self-inflicted dislocations. At any rate there are few serious accidents although Kendo often appears dangerous. The student should ignore any painful blows and never duct or show any sign of discomfort. In actual fact a blow is far more painful if the student cringes. To ignore a blow means that it is rarely felt and normally bruises are only noted when changing after practice.